Elfin Thyme flowers are the typical lilac color of most thymes. The tiny flowers are held very close to the ground. Some years it blooms a lot and some not so much. It blooms in early summer rather than in spring like many ground cover thymes. Elfin Thyme, like most thymes, needs at least five hours of sun a day to keep it from reaching for light and getting leggy. The photo at the top shows a three month old Elfin Thyme plant that was started in early spring from one of our 2 3/4 inch containers. By the end of the first season it measured about 4 inches across. On the left, the same Elfin Thyme plant at the end of the following year. This is actually two plants that have grown together. Like all thymes if it has something to climb up, it will. Filling in the space with dirt, so the thyme may be planted level with the stones, will provide a smoother, flatter look. 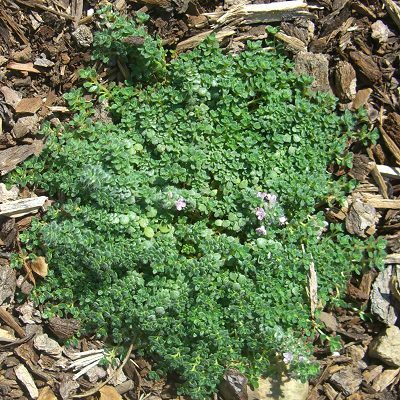 Elfin Thyme's small, closely spaced flowers and leaves makes it not only one of the smallest thymes but also one of the slowest growing thymes. 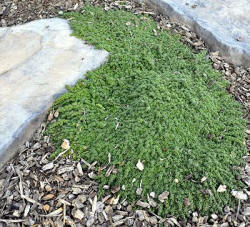 Elfin Thyme is a good choice for planting between stepping stones where spaces may be very small. It is often included in our popular Flagstone Filler Assortment. Other flagstone fillers are Annie Hall Thyme, Highland Cream Thyme, Leprechaun Thyme, Mint Thyme, Pink Chintz Thyme White Moss Thyme and Woolly Thyme. This plant is often available in plug trays. These trays hold 128 of all the same plant. They are a great low cost way to fill a lot of space. Each cell is 3/4 of inch by an inch. 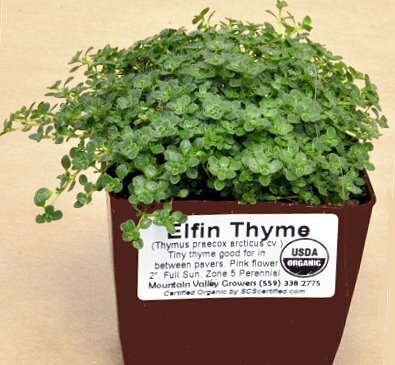 Check here to see if Elfin Thyme Plug Trays are available.